For the most part, critics and reviewers have always stigmatized Bob Dylan as a lousy poet, advising the public to buy his music instead. When his book Tarantula was published by Macmillan in 1971, the reaction was predictable, and has been ever since–keeping in league with what is expected from that failed-artist class bent on bashing the bards they secretly aspire to be, but can’t, for lack of imagination. That common thought restated for the millionth time, I’ll take another unpopular stance: I have never felt a connection with Dylan’s music, nor have I felt the urge to worship him like so many fanatics from so many different generations all over the world. Still, there is something about him that I feel is worth appreciating. Growing up in Minnesota, then going to the U of M (and living under “the watchtower”), I studied the same books Dylan did. I know this because, back in those days at the University Library, you had to sign a slip of paper inside the back cover whenever you checked out a book. And in the books by Arthur Rimbaud, the mythic name of Zimmerman was always there, scrawled in the same ink in which passages were underlined in French as well as English. Meanwhile, Dylan’s popular songs were being played daily (as they are today) on KQ92, and were just as overplayed as the Beatles–because America loves repetition and rhyming just as much as it loves a parade of cliches. The measure of mainstream mediocrity has always been reflected in the most commercial music; ie., the bubble-gum aesthetics of Brittany and the Backstreet Boys, the pop poetics of country western, etc. But back to those whose job it is to maintain the standard standards of a mass market thriving on lyrical lard: their jargonistic journalism seeks not literary genius, but rather simple rhythms to secretly pledge allegiance to, since we all go la la la in our heads when we walk down the street denying the silence of our minds. Reviewers rarely being poets, though, and hardly ever scholars, it’s no surprise they’re out of touch with the history of cutting-edge verse. Plus, the publisher’s dismissive introduction (in which the editor refuses to identify himself) didn’t help Tarantula become recognized as an avant-garde work of postmodern poetics. 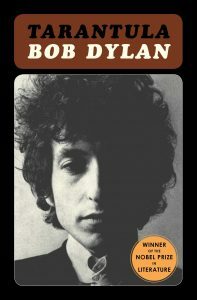 By explaining that the editors “weren’t quite sure what to make of the book–except money,” then employing the disclaimer “This is Bob Dylan’s first book… the way he wrote it,”3 it’s no wonder readers had trouble understanding Dylan’s innovation. Thus, we now have tons of misinformation informing readers about what Dylan was trying to accomplish. For one thing, Rimbaud and Lautreamont were never “nineteenth-century surrealists,” because they predated that movement by half a century (Hey Collins, look up Andre Breton, 1928, and see if there’s a manifesto; Rimbaud and Lautreamont inspired the Symbolists, who in turn inspired the Surrealists, but they never belonged to anyone’s club). Also, Surrealism may have been a Modernist movement, but it hasn’t been a “modern movement” for sixty years. One can only conclude that Collins’ malarkey about “irrational… arrangement of material” must’ve come from the same place he got that baloney about a “writer’s total creative output” allowing for interpretation. Such perspectives on seeing are alien to most people who have never studied the poetics of Rimbaud, but such lyrical language techniques were definitely visible to the visionary Dylan. He practiced these techniques with a skill and ambition that rivaled Rimbaud’s. In fact, no other poet in the Am Po scene has demonstrated such mastery in this department since Walt Whitman. The evidence for this, however, isn’t in the fact that I say so; it’s in the assonance and alliteration which Dylan saw Rimbaud applying to his already super-imagistic verse, making it more musically dimensional than anything that came before–thus, putting an end to centuries of rhyming in France by slaughtering sonnets, killing quatrains, and foreshadowing the future of free verse. It’s ironic, of course, that those who claim Dylan is unintelligible assume that his words have no meaning, but it’s pathetic that they fail to notice who the “garbage clowns” are. If such bumbling media-mongers juggling rubbish took a moment to consider that the poet might actually be a poet and have some insight into human nature, they might decode the metaphor. Meanwhile, there’s an undiscovered continent of sense to be made from the seemingly nonsensical pages of Tarantula. Because reviewers of music are not authorities on poetry, there’s a whole poetic “novel” by Dylan here waiting to be praised for cryptic brilliance. So get past the music, Garbage Clowns, and read the book–but slowly, and out loud, pausing with reflection. 1. Christgau, Robert. “Tarantula,” Bob Dylan: A Retrospective, Craig McGregor, ed. William Morrow & Co., New York , 1972, p. 390. 3. The Publisher. “Here Lies Tarantula,” Tarantula, Bantam, New York , 1972, pp. v,vi,viii. 4. Collins, Steve. “Tarantula: Poems,” Book Reviews, http://poeticvoices.com/0006BDylan.htm (accessed 2/19/2003), 2000. 5. For more on Rimbaud’s visionary aesthetics and the impossible, see “Introduction,” The Collected Poems of Georges Bataille, Dufour Editions, 1998 (2nd ed), pp. xii,xiii; or Bataille, Georges. “The Malady/Greatness of Rimbaud,” translated by Emmanuelle Pourroy, Exquisite Corpse 7, http://www.corpse.org/issue_7/ critical_urgencies/batail.htm (accessed 2/21/2003), 2000. 6. Rimbaud, Arthur. “Bottom” (from Illuminations), OEuvres de Arthur Rimbaud, Mercure de France, Paris, 1952, p. 261. 7. Dylan, Bob. “Black Nite Crash,” Tarantula, Bantam, New York , 1972, p. 76. 8. Joyce, James. Finnegan’s Wake, Penguin, New York , 1976, p. 472. 9. Compiled by Dave Itzkoff et al. “Top Five Unintelligible Sentences From [sic] Books Written by Rock Stars,” Spin, vol. 19, no. 4, April 2003, p. 86.